As a seasoned composer of music for television, film, and theatre, Michael Isaacson brings a finely honed dramatic sensibility to his sacred choral music considering both the blessings and the challenges of a life fully lived. An American Hallel explores the spectrum of gratitude and thankfulness found in the Psalms, Seven Deadly Sins with its seven poetic acrostics penned by Nicholas Gordon, paints a chilling, godless scenario of each self absorbed transgression, and Kohelet, (Hebrew for Ecclesiastes), takes stock and prioritizes what is essential and what is merely a distraction in life's journey. Together, these three Isaacson choral suites present a mesmerizing menu of the possibilities and pitfalls in the traversing of one's odyssey. The accomplished Vermont choral ensemble Counterpoint, under the distinguished baton of maestro Robert De Cormier along with cogent readings narrated by famed actor and singer Theodore Bikel realize and complete Isaacson's aural vision illuminating these new and classic texts for our own meditation, growth, and enjoyment. 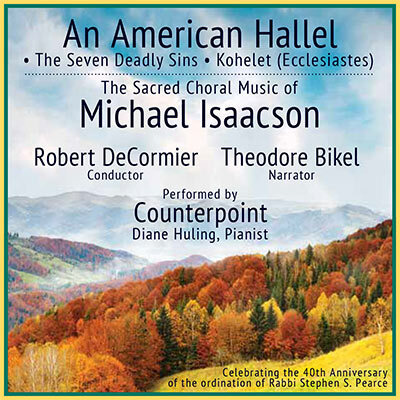 "From the generous music of praise in 'American Hallel' to the edgy drama and wide stylistic range of “The Seven Deadly Sins” to the elegant, highly wrought craftsmanship of 'Kohelet,' this recording is a testament to Michael Isaacson’s versatility and impressive technical command. In fact, in 'Kohelet,' we have some of the most satisfying settings of these familiar verses from Ecclesiastes that one is likely to encounter today. The range of expression in them, from the strikingly austere fourth one, 'The Sleep of the Laborer is Sweet,' to the all-embracing resignation of the final, 'The End of the Matter,' is impressive indeed. In all, these choral works are grateful to sing and very naturally conceived, with their idiomatic textures, rich use of canon, expressive harmony betraying a fine ear, and eminently comprehensible text setting." Counterpoint, Vermont’s 12-voice professional vocal ensemble, likely has made more commercial recordings than any resident group in the state. Its latest, “The Sacred Music of Michael Isaacson,” conducted by Counterpoint founder Robert De Cormier, not only showcases a compelling but accessible contemporary American composer, it offers a uniquely powerful musical take on religion and secularism. Isaacson, a Los Angeles composer born in Brooklyn in 1946, met De Cormier as a graduate student at the Eastman School of Music, where De Cormier was teaching at the time, and the two have been lifelong friends. Best known for his vocal and choral music built around Jewish traditions, Isaacson composes in a variety of styles, though his music — at least on this album — is consistently accessible, harmonically spicy and dramatic. In fact, “An American Hallel” is almost pure theater. This major 13-part work alternates Psalms 113-118 with quotations from great Americans from Abraham Lincoln to Albert Einstein to President Barack Obama, and is a contemporary — and often secular — take on the Jewish celebration of gratitude. Character actor Theodore Bikel, who made his film debut in “The African Queen,” is the charismatic narrator delivering the words of wisdom. Counterpoint, directed by De Cormier, sings the Psalms, sometimes in Hebrew, sometimes in English, narrated by Bikel. Diane Huling performed the dramatic complementing piano accompaniment. The music for the various psalms proved eclectic, one lyrical and dance-like, another contrapuntal, one a pastoral carol, and, finally, just plain joyful. Fine solo work by unnamed chorus members was personally expressive. De Cormier and Counterpoint made this complex music truly compelling. “The Seven Deadly Sins,” with poetry by Nicholas Gordon, for chorus and piano, is a secular, even psychological take on an early Christian idea. Music ranged from harsh, hard and dissonant in the Prologue, to Lust’s Bernstein-like dance. Gluttony is gloomy and sad, while Greed is driven and disjointed, unable to touch feelings. And so it goes until it concludes with the harsh and unrelenting finale, Hell — on earth. The music is dramatic, illustrative and often entertaining, using complex, often harsh, but tonal harmonic language. Counterpoint delivered with clarity and passion, while the truly virtuoso piano accompaniment, a huge part, was brilliantly performed by Huling. “Kohelet,” based on Ecclesiastes, was attractive, but the least compelling work on the CD. There was some variety in the musical structure, but there was also a sameness in the sound — beautifully interrupted by vocal solos. Still, this is a compelling CD, intriguing music beautifully executed by De Cormier and Counterpoint. It gives new music a good name. As one of the only professional vocal ensembles in the state, Counterpoint has long set the standard for this type of music in Vermont. And it's a lofty standard at that. Over countless local and national performances and 10 albums, the 12-member group is exquisitely polished. Counterpoint is under the direction of Nathaniel Lew, an associate professor of music and the director of choral activities at Saint Michael's College. On the group's latest recording, An American Hallel, it tackles the sacred choral music of renowned American composer Michael Isaacson. The album consists of three larger, nonsecular works, "An American Hallel," "The Seven Deadly Sins" and "Kohelet (Ecclesiastes)," that contrast Isaacson's deeply rooted Jewish faith with his American upbringing. The result is a collection of sacred music that is thought provoking and stirring, regardless of the listener's spiritual inclinations. Isaacson is a curious figure. He has a PhD from the prestigious Eastman School of Music and is internationally respected as an elite composer and orchestrator. He founded Michael Isaacson & the Israel Pops and was recently honored, by Hebrew Union College, as one of the 10 most influential sacred-music composers alive. Despite those cultured accolades, Isaacson is not above "slumming it." His credits also include music for several daytime TV soaps and movies of the week, as well as shows such as "Hawaii 5-0," "The Bionic Woman" and, more recently, "Curb Your Enthusiasm." Hallel certainly exists on the higher of those two planes. But there are moments, particularly during the piece “An American Hallel,” that juxtapose the divine with secular observations. The work is composed of a series of Psalms — specifically, Psalms 113-118. But interspersed between those choral pieces, folk singer Theodore Bikel recites passages from the likes of Walt Whitman, Abraham Lincoln, Albert Einstein and Barack Obama. His deeply toned interludes accentuate the lessons found in each Psalm, providing a comparatively modern and distinctly American, well, counterpoint to each verse. It’s an effective device. Isaacson’s flair for the dramatic serves him — and the chorus — well on the works that follow. “The Seven Deadly Sins” consists of nine bracing, foreboding movements that seduce and condemn in equal measures. “Kohelet (Ecclesiastes)” works as a benediction. The composition’s seven movements are striking in their serene beauty and highlight Counterpoint’s impressive blend and balance. In particular, the closing, “The End of the Matter,” is sublime, a delicate work of shimmering sustains broken by sharp staccato passages. But it is made whole again by a blooming resolve beautiful enough to suggest the divine to even nonbelievers.